Chika Ifejika, provincial grand secretary of Freemasonry in Nigeria, speaks to Mike Akpan, contributing editor, on Freemasonry, how it came to Nigeria, what people think of it and other issues. Newswatch: As the provincial grand secretary of Freemasonry in Nigeria, how would you define Freemasonry? Ifejika: I am sure you have heard or read about definitions. In a very simplistic way, everybody else has always defined, Freemasonry. It is a system of morality defined and explained through allegories by both words and signs. 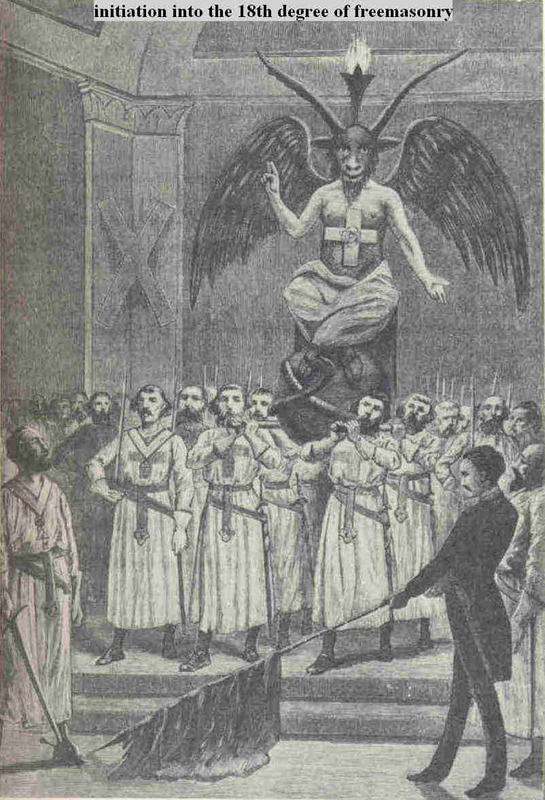 Newswatch: But the way the outside world perceives Freemasonry is that it is satanic. How do you react to this perception? Ifejika: It is unfortunate. It may be it is fair for you to ask: why the word, ‘mason’? And why the word, ‘free’? The word mason is the word you know of – those who mould and build with blocks and bricks; those who build houses, churches, cathedrals. That is the earliest real formation that can be discerned from the Order. So when we say Freemasonry, it is based on building of morality in the society using allegories. We use the symbols, the instruments, the working tools of ordinary field masons to impart moral lessons. You will find out that we are forever using signs. For example, this sign here on the page of this book called the Craft; you see it contains the signs we use when we hold our meetings. This is the compass; this is the square (what the operatives call square). What has it got to do with us? The square says anywhere you measure with it, what it will give you is angle ninety, you measure from the top, you get angle ninety, you measure from the South, Nrth, East or West, you get angle ninety. So it is perfect. So, it is a lesson by saying you are to behave to be in such a moral rectitude that you have to be led on what you work on. The plumbline, that is what the operative mason uses in making sure that the wall is perpendicular and not curved or bent of titled because, like we say in speculative masonry moral lesson, if your character were to be before a character builder and it is titled in one way or the other and not standing upright, you are to fall sooner or later into disrepute. So Freemasonry is out there to help a bad man to become good and a goodman to become even better. That is Freemasonry. It is not a religion and has nothing to do with the devil because it does not admit agnostics or non-believers in God. One clear element you must have to become a Freemason is to believe in God – the one and only supreme and all powerful, all-knowing, all-seeing God. It doesn’t say you are a free thinker. Rather, Freemasonry encourages you to practice your own religion perfectly well, to obey the tenets of your own Holy Book – the Koran for Muslims, the Bible for Christians the Torah for the Jews and what have you. There is no holy book that we know of that can say to the people, kill, go and kill. So, such is the tenet of the fellowship. Newswatch: What is the origin of Freemasonry? Ifejika: I think I have answered this question partly that the well-known line became clearer through operative masons –builders and hence we the speculative builders of morals are expected to see that morality assumes a proper guide in our lives, in our society, in our government. We now use the instrument, the implements, the working tools of the operative masons to impart moral information, knowledge to ourselves and our brothers by living the examples we preach. Newswatch: The origin of Freemasonry, according to some Freemasonry publications I have read, is shrouded in myths, legends and almost impenetrable obscurity. Some Masonic historians trace the origin to the days of Adam, Cain, Solomon and Hiram Abiff, the super-talented master mason. Can you, in the interest of our readers, be more definitive on the origin of Freemasonry? Ifejika: You know even in history, you can never have the same relay of the Second World War told in the same manner by two different authors. It will always differ depending on whose side the historians are and how he has reported it. That is why I have left alone all those records far past gone where records could be scarce but from the days of operative masons, building of cathedrals, high rise buildings and so on and so forth, they became selective of who would be their members. Naturally, such selectness or selectivity would bring jealousy because I am saying that you are not worthy to be in our midst. Newswatch: So how did Freemasonry come into Nigeria? Ifejika: It was brought into Nigeria by representatives of the king or the queen depending on what time. In the early life of Nigeria as a colony, the British king sent to our shores, people to represent him in administering us, in ruling their empire. We called them DOS (district officers). Before we started getting governors in the country, we had secretaries, provincial secretaries, district officers and so on and so forth, their assistants and all that. As far back as 1717, there was already a Grand Lodge of England, 1725, a Grand Lodge of Ireland and about 1735 or so, a Grand Lodge of Scotland, the three known constitutions in Freemasonry. These are the English Constitution, the Irish Constitution and the Scottish Constitution. But basically, the three constitutions are the same. So when the DOs and other colonial officers came, they came with the Bible, they came with education, and with them came rulership. They also came with all sorts of tools in leadership. And they carried double into the society in order to build morals which they had known. They themselves became gradually selective in making Nigerians to become members like the late Chief Isaac Mbanefo, the father of Chief Frank Mbanefo, the architect father of Chief Arthur Mbanefo, the accountant and the late Nigerian permanent representative at the United Nations in New York. His father joined the Craft at the age of 23 because he was working in the UAC (United Africa Company) with the whites and they found that there was in him something that should make him one of them and they took him on. At the age of 23, he became a mason. So that was how it came into Nigeria. Newswatch: How do you recruit your members in Nigeria? Ifejika: From time immemorial, Freemasonry did not or has not been soliciting for membership. Exemplary lives of masons outside attract other people to want to belong to the Craft. People see masons outside, they see the way they behave, they see the way masons react to issues and they want to also belong and they begin to ask what does it take to belong to this society that makes all of you to behave like this? Or those of you I have seen, you are well-mannered, you are well-behaved or you are all this and that and I can assure you, trust Nigerians, some will also say you are all well-to-do. There must be a god in your society that gives you wealth. But doesn’t one good deserve another? If you are good in your job, if you’re working well, won’t you be promoted? Surely, you will be promoted. If you are not good in your job believing you will get promotion because you are the son of an Alake, you will not get anywhere because that does not do the job. So people come into Freemasonry on their freewill and accord. So, they are first of all made masons in their own hearts. They are the ones who decided that they want to become Masons. We do interview them to find out if they are the miss-road people, those often referred to as ‘money-miss-road’ who may think that there is power behind Freemasonry. Yes, there may be power but it is for the individual to discover and develop. Is there power in the church? Yes, there is power but not everybody who goes to church possesses the same level of power as the next person. Isn’t it? It is through your dedication, what you read, what you practice, what you do, what you emulate that helps you to develop. Newswatch: What is the strength of your membership in Nigeria? Ifejika: It is less than ten thousand and yet people are worrying about them. It means there is something interesting and peculiar about the movement and the people in it. It is who they are and what they represent that is the issue. The fact that they want to get accepted or invited, the fact that they want to come into it, means they will be welcomed. Even these days, many are leaving for the churches. We wouldn’t know why. We don’t want to ask them. Others are there. But the churches are built by Masons. How? Holy Trinity, Ebute-Ero, was established and built by Masons. Until a few years ago, the Masonic inscription of the compass and the square was there and said “This church was built by Freemasons of Nigeria. The Masons also built the Cenotaph. So what is devilish about it? And if we must go further, who and who are really the members? In any case, go through the ladder of the reverend gentlemen in the church, they were all Masons – all the Ogunbiyis, who eventually founded the Reformed Ogboni Confraternity. Let me tell you that the first bishop of West Africa and the first bishop of Lagos, Leslie Gordon Vining, was a Mason. When they went to a conference in Sierra Leone, the bishop told those who went with him, “Let them raise the issue and I can assure you that if they raise the issue of our Freemasonry, the archbishop of Canterbury would not find it funny or take it lightly . Bishop A.W. Howells (father) and A.W. Howells (son) were Masons. Freemasonry and religious relationship is more of a meeting point than the parting of ways. Archbishop Howells had a church erected in his name off Western Avenue here in Lagos and the Cathedral there. Archbishop Vinnning, were they really bad and they built churches in their names? Then something has gone wrong somewhere with the Anglican constitution. I can tell you that there were many reverend gentlemen of the Anglican Church in Nigeria who were Masons. The list is very long. How suddenly it happened that Freemasonry is now an evil? Freemasonry is now an evil in the society? The builders of their churches, the builders of their faith on whose backs they want to ride to Heaven were devilish and this was found out only after they had gone but they erected edifices in their honour? There is hypocrisy there which means somebody is not telling the truth, the whole truth. The Alakijas, the judges we had both white and Nigerians were Freemasons. Newswatch: The general feeling of people out there is that Freemasonry is a secret society. Is it a secret society and if so how secret is it? Ifejika: Secret to the extent that we don’t need to tell you what we’re doing at our meetings. Must you know? Even in your clan or compound (for those who would prefer to us the word for a compact unit) you don’t tell the next compound what you are doing when you hold your meetings or what you are going to decide on. When the last (current) Pope was installed, were the Catholics laity really there? Was any Reverend Father there? The least people who were there were cardinals and they were not there all the time. Okogie (Anthony Cardinal Okogie) went there, finished his part and came back even before the man was installed. Did they tell us what they were doing inside there even before the Pope was installed? We only saw an installed bishop (Pope). Even when the ordinary priest is installed (ordained) a reverend gentleman, do you know what happened before the day you saw him lying down and kissing the altar? No, he had gone through the grill. Were you there? All the oaths he took, were you there? Just three weeks ago (October 3,) our people serving in the Presidency were made to swear to an oath of secrecy. And the newspapers were yelling: Are we organising another cult? What is this? But it had served a purpose there. Newswatch: It is believed that Freemasons are under an obligation to protect their fellow members even in criminal cases once they identify themselves through a Masonic sign. How would you react to this belief? Ifejika: It is a big lie because nobody has ever quoted this. At one time it was assumed that the Metropolitan police of London were favouring members who were Freemasons. An inquiry was conducted but it was nowhere there. I want you to listen to this. On that crucial date, October 14, 1996, Mr. Tony Blair, leader of the Labour Party, in opposition, proclaimed in a speech made in South Africa that what is urgently needed now is the promotion of a new social morality. What was he talking about? A social morality! Tony Blair! Newswatch: Is he a Freemason? Ifejika: Probably he is. I wouldn’t know every member. Probably, he is not but as you know, up to 25 American presidents were Freemasons before their departure to the Grand Lodge above. Newswatch: What is the difference between Freemasonry and secret Cult? Ifejika: Secret cults will normally hold their meetings in secret and nobody would know but in Freemasonry, our addresses and places of meetings are known like you have come to this place (Provincial Grand Lodge Office) even though you’ve not come here before. But now, you know it. The address and name are there for anybody to see and identify. Our books are sold where you can get them and when you come to buy; you will not be asked whether you are a member. Nobody will ask you to give a sign. The book sellers are not even members some of the time or most of the time. So you can go and buy the books and read and discern what you can from them. Would that be secret? What then is secret? People know the time we meet; we advertise it on the internet. Who then is deceiving who? Freemasonry is not a secret society whereas a secret society would not want you to know when members meet and where they meet. Newswatch: Why are Nigerian Freemasons shy to be identified publicly? Ifejika: Not all are shy. As you can see, I am not shy to be identified. So there is no point generalising. In every society, in every gathering, in every class, some people are looking for those who will be in the front and they will bring up the rear; they will never want to lead or shoulder themselves. It is also possible that some of us still have a conflict of: Do you want to argue with the church and go away or you want to remain in the church and still remain a Freemason? So they don’t tell the church that they are Freemasons because they feel that everybody will detest them. Newswatch: At what point did the church find Freemasonry evil? Ifejika: When it pleased them in one of their synods. Newswatch: I know that in the Catholic church Pope Clement XIIproscribed Freemasonry as far back as 1738. When did it happen here? Ifejika: As far as I know, the action has no basis because former archbishops of Canterbury were Freemasons. The current archbishop is also a Freemason. He is also the head of the Scotland Constitution. So what are we talking about here. It is all hypocritical. Newswatch: So how conducive is the Nigerian environment for the practice of Freemasonry? Ifejika: Very very conducive. Please don’t forget that Freemasonry is not a religion but it helps you and encourages you to practise your religion better. For example, if you are a Christian, Freemasonry tells you to study your Bible assiduously. It says read your Bible without questioning the word of God because the knowledge is bottomless and above you. Newswatch: How true is the assertion that Freemasons rules the World? Ifejika: You have already said it. I told you there was a time when the Nigerian society was ruled by Freemasons. Go through the list I have given to you and tell me who is not there. Where would you go to? The civil servants, the judges, politicians, lawyers, the clergymen, the professionals – they were there. Newswatch: What is the situation today? Ifejika: It is not so anymore. Ifejika: The corps of the makers and shakers of Freemasonry had gone. Probably, the up-comers are not appreciating in full as yet what it is. But the fight from the churches has also affected it. People confuse and even compare Freemasonry with religion; But Freemasonry is not a religion because it does not administer sacraments. It doesn’t promise members Heaven by saying if you do this or that, you will get there. Freemasonry urges members to obey the moral laws because you will be judged by the same immutable laws that everybody else will be judged. God created everybody equal whether you agree with this position or not, it is there. Newswatch: I have gone through some of the Freemasonry publications and found out that the Craft has a special regard for Saint John the Baptist and Saint John the Evangelist, what is the relationship between Freemasonry and the Saints? In America, Freemasons even celebrate the birthday of Saint John the Baptist. Ifejika: Good. Countries have what is called patron Saints. In Ireland, it is Saint Patrick and we the Irish Masons, Irish Constitution, will not hold any meeting on St. Patrick’s feast day because our own constitution came from the Irish. In Scotland, the patron Saint is Saint Andrew. On the Saint’s birthday, Freemasons under the Scottish Constitution join the happy celebration. The Saints’ feast day celebration has nothing to do with Freemasonry. It has to do with the country of origin. In fact, by yesterday October 1) my Reverend Father asked us at early morning Mass who is the patron Saint of Nigeria? Many could not answer the question. He told us that the patron Saint of Nigeria is Mary, the mother of Jesus Christ. He said that is the situation in spite of the fact that Nigeria is a multi-religious country. Newswatch: Now, what is the future of Freemasonry? Ifejika: There is a deliberate effort now to build the (craft on a very sound basis re-echoing the same ethos which the past masters who ruled this country and who also brought Freemasonry into Nigeria and who sustained this country, were able to keep up with it till their departure to the Grand Lodge above. In no distant time, you will hear about the formation of a Grand Lodge of Nigeria because many countries are having their Grand Lodges. The battle to create one had been on for the past 20 years but the issue was settled last August. We can’t have a Nigerian Grand Lodge and be going down. In fact, Freemasons are now ready to talk as I am talking to you now. But before, Freemasons could not be bothered by how the public perceived them or what is said about the Order. We just kept quiet. But now we should talk. Newswatch: In 2004, a high court judge in South Africa was quoted in a Freemasonry newsletter as referring to Freemasonry as a hand maiden of the church. What do you think he meant? Ifejika: What else could he mean? If in Nigeria we were able, in our own lifetime, to see archbishop of West Africa, Archbishop Vinning as a Freemason, to see Archbishop of West Africa, both of them Freemasons, and they were both in the church, so how will you see it or what do you want to say? In the same manner, I told you how elsewhere, in Scotland, for instance, how St. Mary’s Church, in Haddington was being used for Freemasonry initiation. So there is more of a relationship in the societal norm and lessons to be learnt from the church and Freemasonry. Freemasonry per se is not a religion just as I said about the knighthood but that they are interwoven. This entry was posted in Illuminati Elites, Occult Agenda, Secret Societies. Bookmark the permalink. i want to be a member how do i go about it? i love this lodge,and want to be a member,please e-mail me how to do this tank you. hi, am a nigerian and i would want to know more about your organisation and the procedures to be a member of freemason. i want to be a member and how do i go about it please. i wish to be a member. how do i go about it. Guys, all the information required for membership is available to you, and the way to go about printed in this text. Masonry will no search for you, its expected of you to enter, when your good and ready and with a shy air of awareness. Check your local papers, the meeting times are usually printed in there.